Tara graduated from Kansas State University in 2010 with a Bachelor of Arts degree in Journalism and a minor in leadership studies. Upon graduation Tara worked for ALDI, a grocery retailer, as a District Manager for six years. Those six years as a District Manager gave Tara the opportunity to live in three different states, manage over 100 employees and perfect her business and leadership skills. Originally from Olathe, Kansas, Tara moved to Dodge City in January 2016 and started working for PepsiCo in April 2016 as a Sales District Leader.  Tara joined the Dodge City Area Chamber of Commerce in January 2017 as the President. Tara has enjoyed being a part of the community and looks forward to helping enhance the business climate in Dodge City. Tara and her husband, Michael, enjoy spending their time cheering on the K-State Wildcats, attending auctions, traveling, and spending time with family in Dodge City and Kansas City. Originally from Midland, Texas Marisa has been proud to call Dodge City her home for over 16 years. Marisa graduated from Dodge City High School in 2003 and continued her education at Dodge City Community College where she focused her studies on early childhood education. In the future, Marisa hopes to further her education and obtain a degree in marketing. Marisa is a member of the City of Dodge City’s Cultural Relations Advisory Board, Rotary, and serves as the staff liaison for the Chamber’s multicultural and ambassador committees. In her spare time, Marisa enjoys spending time with her family, three children, dogs – Coco and Chanel, and her rabbit – Blue, as well as volunteering in her church and for other community organizations. Joni coordinates many of the Chamber events such as the Annual Chamber Banquet, Ambassador Golf Tournament, State of Luncheons, Legislative events and is also the coordinator for the Dodge City Days Planning Committee. Joni serves as the staff liaison for the Chamber’s young professionals committee. When she is not planning, directing, organizing and creating events at the Chamber, you can find Joni planning, directing, organizing, and creating events for her husband, son, family and friends. Michelle is responsible for bookkeeping and helping support daily operations for the Chamber. Michelle is relatively new to Dodge City and comes to us from Olathe, KS where she worked as Assistant Market Center Administrator for Keller Williams Diamond Partners Realty. She holds a bachelor’s degree in Business Management/Accounting from Emporia State University and is a Professional Realtor with Real Estate Professionals of Dodge City. Michelle is an avid reader, loves to drink coffee, and enjoys fellowshipping at her church, The Gathering Dodge City. Michelle lives with her husband Ryan, Administrator for SunPorch Dodge City, and their beautiful tuxedo cat, Millington.